Last night, while waiting for our pizza, we began to reminisce about old Nintendo games. So after we finished eating dinner, it was only natural that we went in search of Gene’s NES console and games (he was smart enough to keep them all). We pulled everything out from the basement and after about 15 minutes of trying to figure out how to hook it up, thanks to Elisabeth’s google skills, we got it working! The next 30 minutes we took turns playing Mario 1 and 3. 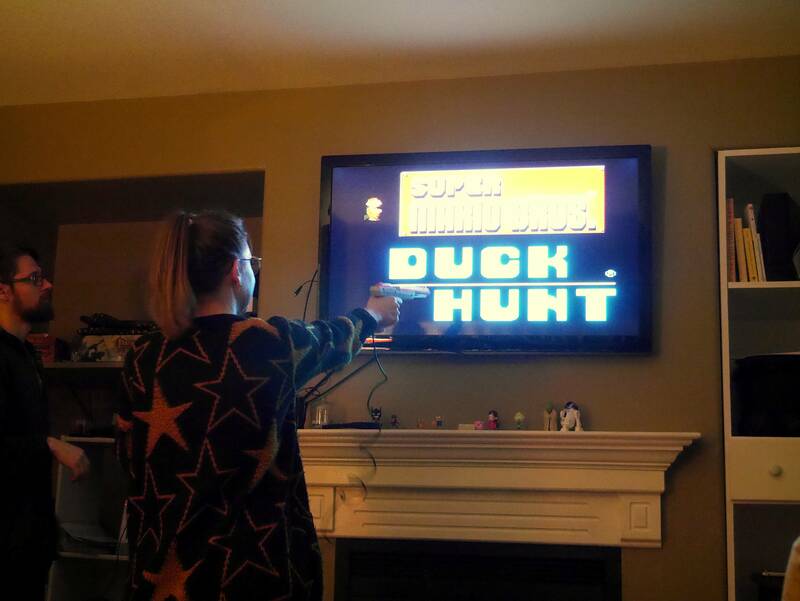 Sadly, because of the way TVs are built these days, we couldn’t play Duck Hunt, but Mario worked quite well. Sidney and Gene impressed me not only by their skills but by the fact that they remembered many of the secret tricks and entrances in the games. I guess that stuff sticks with you from childhood. After that we watched an episode of Star Trek: The Next Generation, a show I love and that Sidney and Elisabeth are watching for the first time. So many wonderful episodes await them! Previous Post It’s National Pizza Day! Never lose your inner child!